A surefire way to thaw that winter chill, this vegetarian stew is beautiful, healthy and delicious. Think of the recipe as a jumping off point. Feel free to add other veggies to the pot too — this is a terrific way to use up whatever you have on hand. From Better Homes and Gardens Low-Salt Cooking. 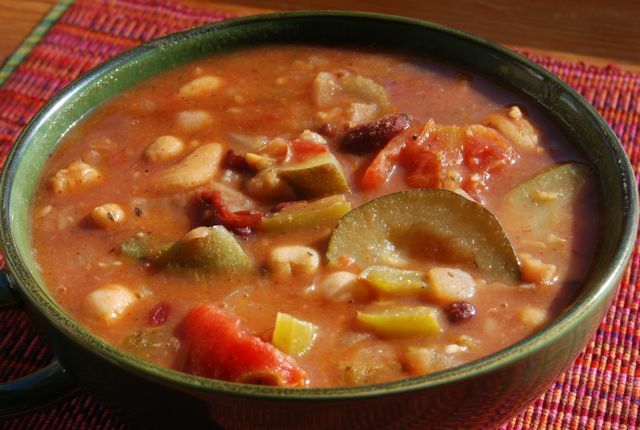 In a Dutch oven or stockpot combine UNDRAINED tomatoes, UNDRAINED beans, onion, green pepper, celery, zucchini, garlic, water and seasonings. Stir to combine. Bring to a boil over high heat. Once boiling, reduce heat to low, cover and simmer 1 hour. Add peanuts or cashews and heat through. Remove from heat. Remove bay leaf and serve immediately. This entry was posted in Main Dishes, Vegan or Vegan Adaptable, Vegetarian. Bookmark the permalink.